Bulgogi Brothers is a "hanwoo" (Korean beef) restaurant that serves good quality meat ("Korean bbq" over grill) and Korean food at a better quality than most casual restaurants. 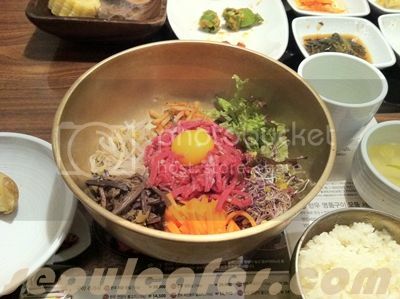 If you're looking for a nice casual Korean food restaurant that is comfortable to sit and dine, B.B. is a good option. This one is located in in SFC (Seoul Finance Center) Mall in Gwanghwamoon station. I haven't been to other B.B. restaurants to tell you if they are all consistent, but I have found restaurants at SFC Mall to have better quality overall. SFC Mall is not the typical "shopping mall", but an arcade of restaurants and cafes. If you're in Seoul and new to the city, I would recommend this place if you want to eat somewhere quiet and indoors with lots of options. They have variety of restaurants from Korean, Japanese, Indian, Italian, American (burgers)..and cute cafes (like cafe 5cijung and Hotel Douce), too! Service: Attentive, there's a "call button" on table if you need help. LOCATION: You can get there by getting off exit 5 off GwangHwamoon station, walk past a block and the stream way on the middle and on the next block on your left you will see an underground entrance to the SFC Mall. They have variety of restaurants and cafes inside.